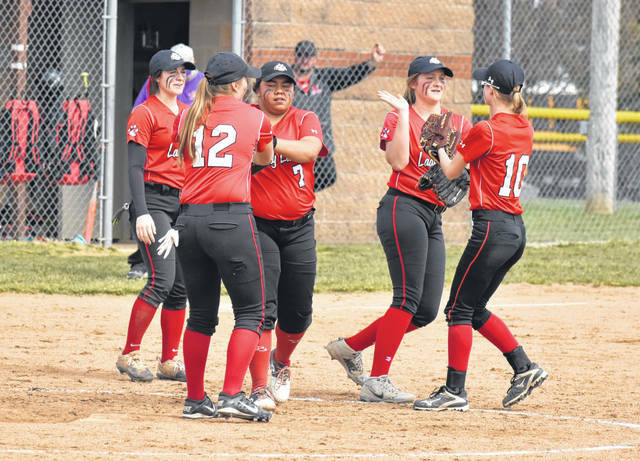 The Fairfield Lady Lions infielders celebrate with starting pitcher Kaiti White (7) after a strike out against the McClain Lady Tigers on Saturday, April 6, at Fairfield High School. An absolutely beautiful day for softball at the Fairfield Baseball/Softball Complex Thursday afternoon allowed the Fairfield Lady Lions’ fans to become witness to one of the rarest of feats in softball or baseball, the Perfect Game. It is so rare that there have been only 21 perfect games thrown in Major League Baseball since 1900. Two time All Ohio Fairfield pitching ace Kaiti White threw her second career perfect game Thursday as the Lady Lions hosted Southern Hills Athletic Conference rivals the West Union Lady Dragons in a 13-0 shutout win. Kaiti White struck out 14 out of 15 Lady Dragon hitters. West Union’s Mackenzie Bickett was the only Lady Dragon batter to put the ball in play, a fly ball to the second basement in the top of the fourth inning. The victory was Kaiti White’s 12th win of the season which includes 8 shutouts. The Fairfield Lady Lion’s offense would again score double digit runs (13) on double digit hits (10) as the Fairfield Lady Lions (12-0, 8-0 SHAC) defeated the West Union Lady Dragons (0-10, 0-7 SHAC). The Lady Lions would score four runs in the first inning, five runs in the second inning, three runs in the third inning, and one run in the fourth inning. The Fairfield Lady Lions would have ten different players have hits. Leading hitters for Fairfield: Lyndee Spargur (1 for 1, 3 runs, 1 rbi), Megan Gragg (1 for 2, triple, 2 runs, 1 rbi), Kaiti White (1 for 3, 1 run, 2 rbi), Layla Hattan (1 for 3, 1 run), Lauren Arnold (1 for 2, 2 runs, 1 rbi), Taylor Lawson (1 for 2, 1 run, 1 run, 2 rbi), Hayleigh Lowe (1 for 2, 1 run), Molly Thackston (1 for 2, 1 rbi), Halle Hamilton (1 for 2, 2 runs, 1 rbi), Kylie Fauber (1 for 1). Kaiti White (12-0) was the winning pitcher and perfect in the circle today for Fairfield. Kaiti’s Pitching line: five innings, no hits, no runs, no earned runs, no walks, and 14 strikeouts. Maci Shoemaker (0-10) suffered the loss for West Union. Shoemaker’s pitching line: five innings, 10 hits, 13 runs, 10 earned runs, five walks and four strikeouts. The Fairfield Lady Lions will travel to Akron this weekend to play in the Akron Racers Spring Showcases Tournament (three games) and the Akron Racers JV Jamboree Tournament (three games).